Since 2001, the 150-plus members of Men With Heart have raised over $850,000 in the fight against breast cancer. And in 2009, we are well poised to break the $1 million mark. Yet our quest has always been about more than the money. It’s about supporting others in the battle. It’s about sharing heartfelt stories with people from all walks of life. It’s about lifting spirits, offering a hand, and being there when it counts. It’s about being part of something bigger than ourselves.In 2009, we hope to re-engage many of our members who have taken part on one or two walks, but who haven’t participated lately. At the same time, we plan to recruit aggressively to bring new men into the fold. Please consider returning or joining anew. Click here to read more about MWH’s history and our plans for 2009 and beyond in my full letter. MWH 2009 Launch Party Upcoming! Men with Heart is h aving a party on Monday, Jan 26 at 6:30 at Todd English’s Kingfish Hall at the Faneuil Hall marketplace in Boston. Please join us for great food, wonderful company, and the debut of MWH’s new brochure & website. This party is not about fund-raising, silent auctions, or even a raffle … it’s just going to be a fun party, bringing together friends, teammates, and supporters. We encourage you to invite your families and friends who have supported your MWH efforts. We are still nailing down the details, but our hope is that since the party will take place on a Monday night, guests will only have to pay their bar tab and Kingfish Hall will donate the appetizers. Oprah Gives MWH a Car! This past May, Men with Heart was recognized by the Oprah Winfrey and Ford Motor Company as part of the primetime Big Give TV show. Inspired by the generosity of the gift, but unable to make direct use of the vehicle, we sold the car for $20,000 and are now putting the money to use in the fight against breast cancer. Winning a car from Oprah is certainly a uniq ue way to be honored – the award helped MWH gain valuable exposure and ultimately raised $20k for us to use in the fight against breast cancer. The credit belongs to Cindy Callahan of Lowell. Cindy was fan of the TV program Oprah’s Big Give, and when Callahan caught wind of Ford Motor Co.’s “Watch and Give” contest, which offered winners 10 new Ford vehicles, she wrote a letter praising the efforts of Men with Heart. Cindy wrote about walking with one of the MWH team members during the Komen 3-Day Walk along a particularly difficult stretch through the Blue Hills Nature Reserve. Cindy credited her time spent and the encouragement she received from that MWH team member for getting her through the day and ultimately the walk. Coincidentally, when Cindy walked out of the Blue Hills, she walked onto a road named Cynthia Way. 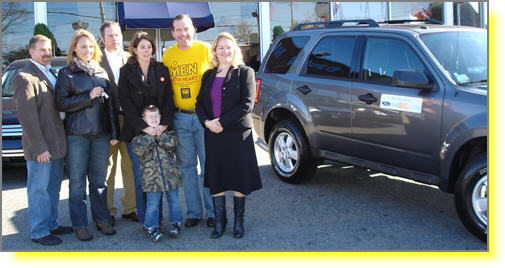 Cynthia – the MWH team couldn’t be happier that you wrote that letter and won us the car!!! It’s worth noting that Cindy is a repeat walker and crew member during the Komen walks. She is part of the Pink Angels team. The Pink Angels are an incredible team of walkers who year after year field the largest team in terms of members and funds raised. They bring the most colorful cheering support squad including Wayne, the patriarch of the Pink Angels. In 2007, Men With Heart expanded its reach from the land to the water when it sponsored the first annual Jenny Birch/Susan Snow-Cotter Memorial Regatta to Fight Breast Cancer. Two events – a child/teen sailing regatta and a grownup benefit party – netted nearly $30,000 for breast cancer treatment and research, with the funds split evenly between the Dana Farber Cancer Institute Infusion Facility and the Dr. Susan Love Research Foundation. In 2008, an additional event was added to the mix: all-ages rowing races. Last summer, the 2nd annual B/C Regatta brought together dozens of sailors, scores of rowers, and hundreds of partiers, yielding another $25,000 for the cause. The B/C Regatta honors the memories of Jenny Birch and Susan Snow-Cotter, two women who died of breast cancer within a month of each other in 2006. Although they never met, Jenny and Susan had much in common: Both women resided in Hingham , Mass., each with their husband and two young children. Both were avid mariners, Jenny from a sailing family and Susan from a rowing family. Each woman earned a master’s degree and worked for socially beneficial causes. In August 2009, the 3rd edition of the B/C Regatta will take place. More info will be forthcoming as the event draws closer. Details will also be posted on the Men With Heart website (www.menwithheart.org) and the Birch/Cotter Regatta website (www.bcregatta.org). Stay tuned. Help Get The Word Out in 2009! The $20,000 Oprah car windfall car has given the MWH financial resources to invest in our technical infrastructure and marketing efforts. In 2009, MWH members will be able to set-up personal web pages and raise donations online. We have also started an outreach program to local hospitals and breast cancer enology centers in an effort to raise awareness and recruit men to the team. We need the help of our team members and friends to help us distribute our new marketing materials. Please take a moment to read about our efforts and how you can help those efforts. MWH has been working on improving our branding and recruiting efforts. Now that we have created new professionally designed brochures and recruiting flyers, we need your help distributing these items. • Brochure – we have been working with Cynthia Frawley Graphic Design (www.cfrawldesign.com) to create a new brochure describing MWH, our mission and how folks can get involved with our team. • Brochure and Pop-up – this is a very exciting development for MWH. These pop-up holders and brochures are designed to grab attention of people in well-trafficked areas. Are you willing to ask your local coffee shop or sub shop to display these holders? What about in your office? Do you have connections to get these displays into chain stores? Banks? We need your help. Please contact Scott if you have ideas or would like us to send these to you. • Recruiting Flyer – We are creating a Avon 2-Day & Komen 3-Day recruiting flyers. Please help us distribute these flyers – hang them in your office, give to clients & customers, or simply hang in visible spots in your community. The success of MWH is based on finding new men to join the team. We need your help getting the word out to recruit men on the team. Please contact Scott if you would like material to distribute (scott@menwithheart.org). This year, in an effort to get more individuals involved in the organization of the walking teams, we have established Team Captains. We would like to introduce to you the 2009 Avon Walk 2-Day Team Captain, Angelo Liapis. When asked about the source of his motivation and desire to get involved in the fight against breast cancer Angleo replied, “My girlfriend is a member of the ‘Pink Angels’ and she got me involved to the cause. I started walking to support her and to raise awareness. I have a 9-year-old daughter, Katerina, and she is my biggest motivation of all.” Angelo characterizes the spirit that is core to what MWH is about. He has already begun to create the support that this year’s team will find incredibly helpful and motivating. Angelo is originally from Athens, Greece and currently owns and operates a general contracting business in Peabody, Mass., BetterBuilt Enterprises. He originally heard about Men With Heart through his association with the Pink Angels and has been a MWH member for over a year now. To date, he has participated in a number of breast cancer related events including the Avon 2007 Walk (crew), Susan G. Komen 2008, Walk for Strides 2007 and 2008, Race for the Cure 2007 and 2008, NSMC Breast Cancer Walk 2008. Expressing his hopes and vision for the upcoming 2009 Avon team and walk, Angelo expressed a desire “to get a big group of guys together to walk, support, laugh, cry, and have a lot of fun”. 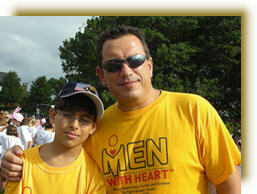 If you would like to join Angelo on the MWH Avon Team contact him at angelo@menwithheart.org.